Death is one of the most feared cards in a Tarot Deck, and it is very misunderstood. Many people avoid mentioning this card because it has that much power. Most times, people take the name of the card literally. 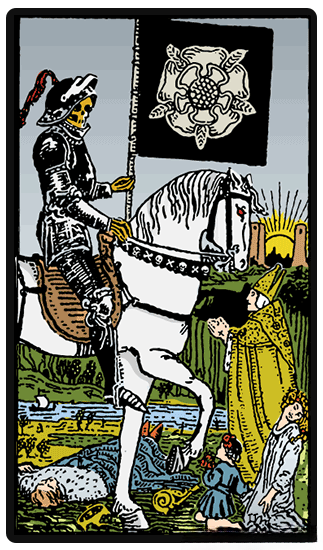 However, the real meaning within the Death card is one of the most positive in the whole deck. The Death card signals that one major phase in your life is ending, and a new one is going to start. You just need to close one door, so the new one will open. The past needs to be placed behind you, so you can focus your energy on what is ahead of you. The Death card signals that one major phase in your life is ending, and a new one is going to start. Another meaning is that you are going to go through a major change, transition, or transformation. The old version of you needs to ‘die to allow the new you to be created. This can be a scary time for you because you may be unsure of what will happen in the future. Even if you are scared, you should welcome the change because you are opening the door to new life events. Death can also mean that you need to let go of any unhealthy attachments that you have in your life. This is an important part of life, so learning to keep moving forward is one of the lessons Death teaches us. The Death reversal meaning is still about change, but that you have been resisting it. You could be worried about letting go of the past, or you could not be sure of the changes that you need to make to go forward. Resisting the change and holding onto the past can limit your future, which can cause you to feel like you are in limbo. You should take some time to assess the ways that you have been approaching changes in your life. You may find you have been halting the changes that you need due to fears of the unknown. While you can still be afraid, you should trust that you are taking the right steps and move forward. Life moves on, so fighting passing time is only going to leave you with regrets. Death does not have to be a card of regret, especially if you heed its warning.